This post is sponsored by Fetch My Meds and the BlogPaws® Pet Influencer Network™. I am being compensated to create awareness about the Fetch My Meds pharmacy discount program for pets, but we only share information we feel is relevant to our readers. Fetch My Meds is not responsible for the content of this article. We love our pets and will do anything for them, especially when they are sick. Sometimes that means they need medication to help them feel better. I know pet prescriptions can be costly. We cringe at the price tag pet medication has on top of the vet bill. However, we no longer have to worry about the high price of our pets’ medication with Fetch My Meds. 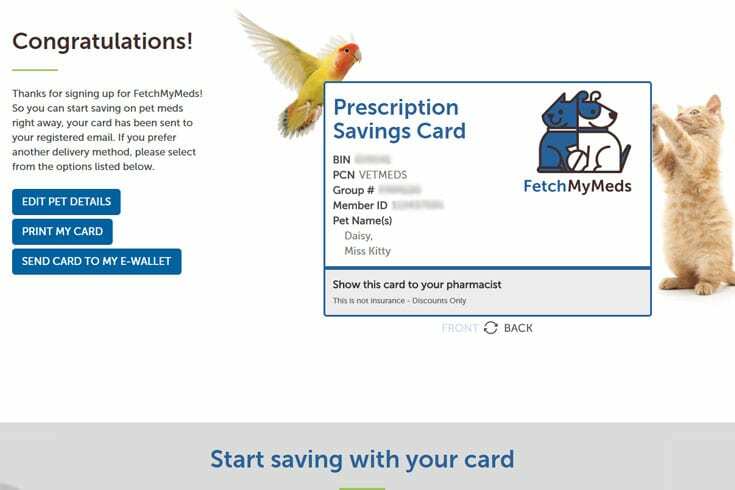 Fetch My Meds is a discount card (not an insurance card) that allow you get your pets meds for less at a local pharmacy! You just need the Fetch My Meds card and a written prescription from your pets veterinarian. Ready to save up to 70% on pet medications? It is simple to sign up for a FREE pet prescription medication card, just fill out a short form! Easily find participating pharmacies and see what your savings will be with the drug pricing tool. I currently hold a pet prescription discount card for our cat and dog. I am prepared for when they will need medications. Signing up was a breeze too! If you have 2 minutes, you have time to get a discount card for your pets. First, got to Fetch My Meds Sign Up and fill out the form. It is the simplest form you will ever fill out! See a picture of the form below. That is all there is to the form! When you are done adding your pet’s information and agree to the Terms of Service, simply click the “Fetch My Card” button. Instantly, you are given your Fetch My Meds Discount Card. I printed my card but you can easily add it to your e-wallet as well. 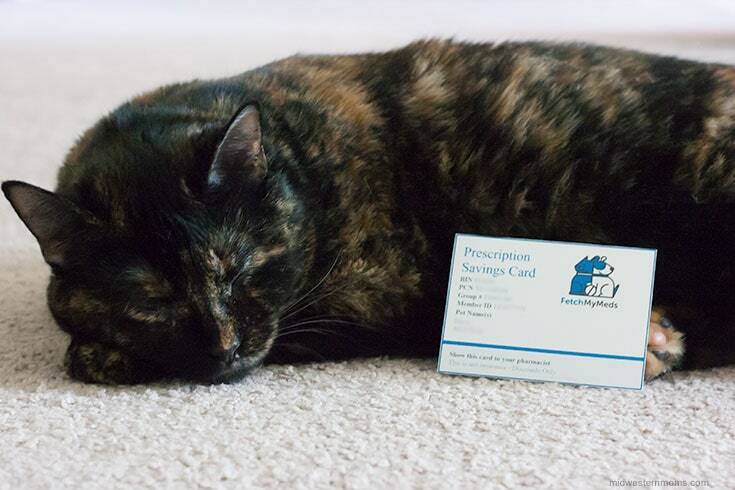 Miss Kitty is very happy to have her pet medication discount card. She can rest now without worry that her “sister” and herself will not cost her family an arm and a leg. 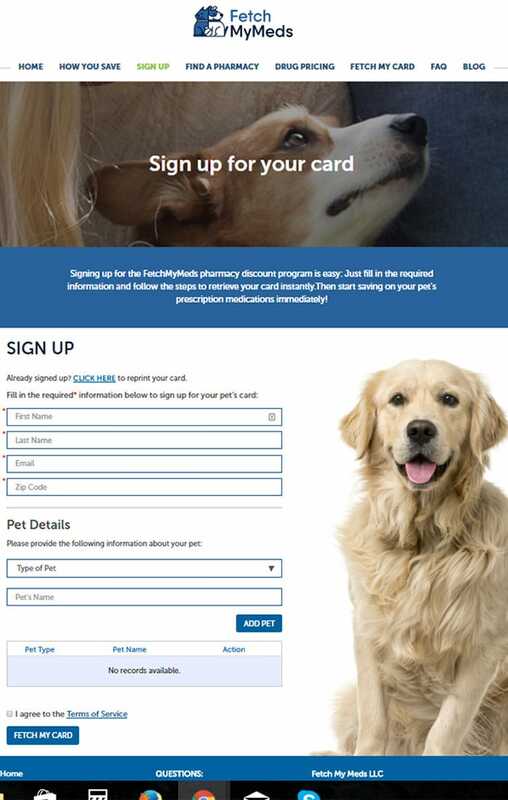 Visit Fetch My Meds to sign up for their FREE Prescription discount card and start saving today! Stay up to date with Fetch My Meds by following them on Facebook and Twitter. Devon, if i sign-up for fetch my meds card could i get it sent to my home address because i don’t have a printer to copy it off with? And how much does this fetch my pets meds card going to cost me anyway? Please Reply back ASAP! Thank-You! The only options is to print your card to send a digital copy to your digital wallet (if you have an apple device). Sorry about that. The Fetch My Meds card does not cost you anything to obtain the card. Feel free check out their site. They have a FAQ section as well. You can even check out the savings!